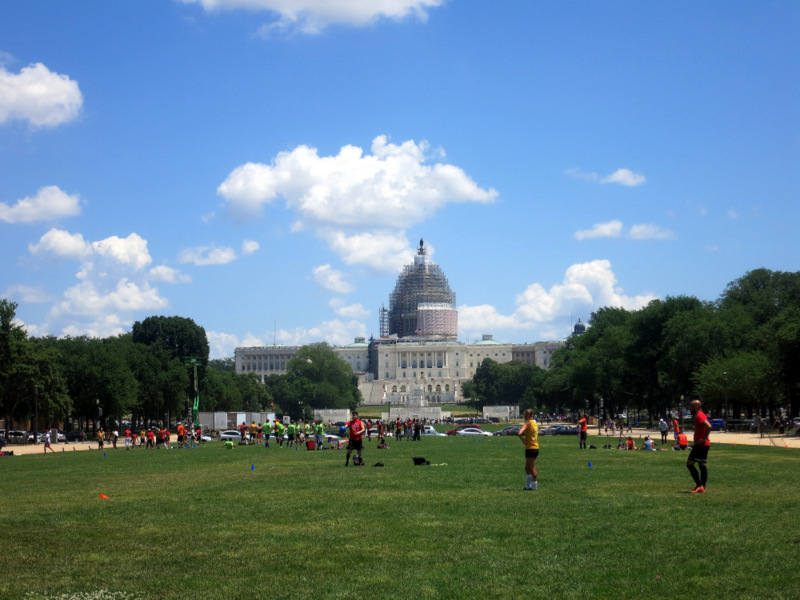 One of the things on our “must do” list while traveling around the eastern half of the country was a visit to Washington D.C. It had been many years since either of us made a trip to D.C. and we were excited to re-visit all the great museums and memorials. We decided to spend two weeks so we could have a full weekend for exploring the city. After discovering that most of the nearby campgrounds were pretty high priced we decided to stay at the Greenbelt Park. This is technically a national park, but not the kind you’re thinking of. I think it’s probably only a national park because it is located on federal land. It certainly doesn’t have anything that makes it deserve national park status. I am going to skip a long winded complaint session and instead just say that this place is probably not worth even the $16 per night fee. If you want all the details about the tick infestation, filthy bathrooms, and unbearably slow Internet that finally caused us to leave earlier than planned, you can check out my Campendium review. The one redeeming quality of this campground was the location. With three metro stations only a mile or two away, this proved to be a great spot from which to explore the city. 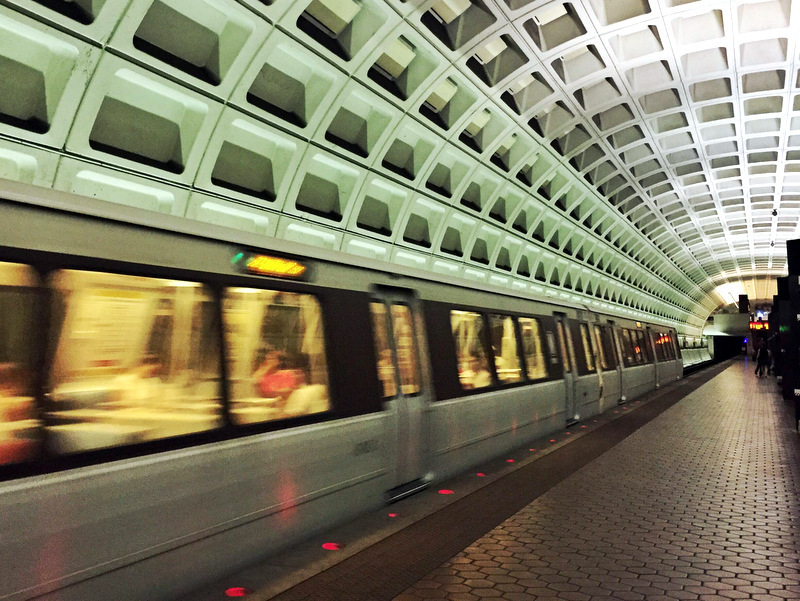 Both weekend days we headed over to the Greenbelt Metro station (where parking is free on the weekends) and took the train into the city. Talk about convenient. We also could have walked a mile and half from the campground to the College Park Metro station and not had to bother with parking at all. Since we knew we had some really long days of walking ahead of us, we decided against adding an extra 3 mile round trip, but it could have been a good option. 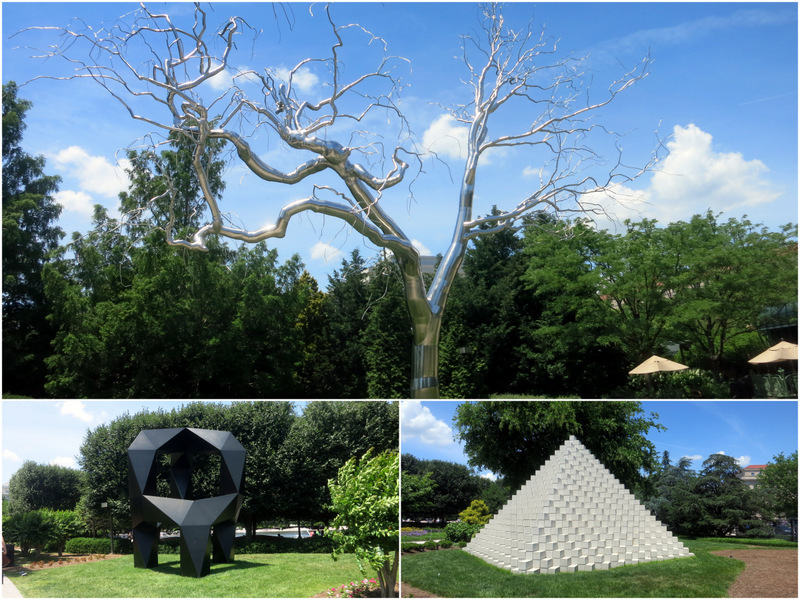 By the time we got into the city the first day it was already pushing 90-degrees outside (just our luck that D.C. was having an early summer heat wave) so we headed straight to the nearest museum. Which happened to be the National Museum of Natural History. 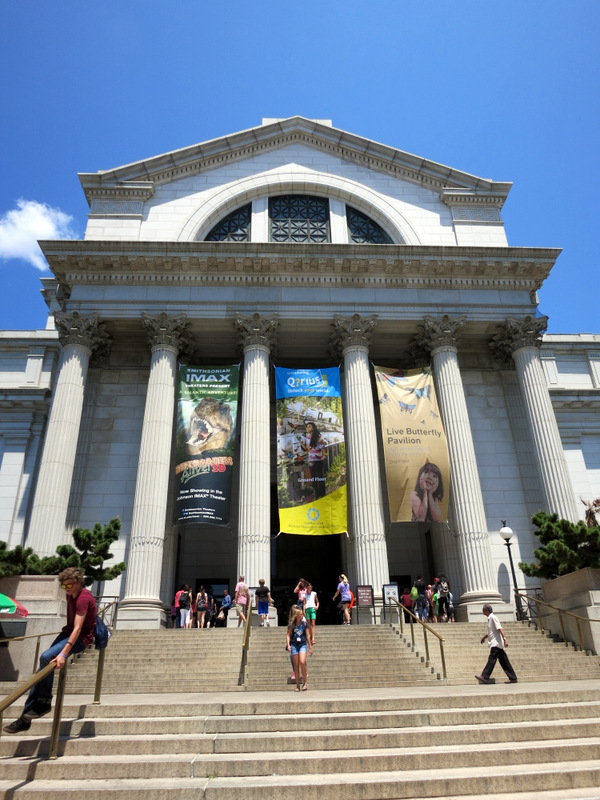 Anyone who has ever visited any of the Smithsonian Museums knows that you could easily spend an entire day exploring each one. Since we didn’t have that kind of time, we made the decision early on to pick only a few to visit and not spend forever reading every plaque and examining every display. We also made a pact that we would not let the crowds diminish our enjoyment. This is something we’ve actually gotten quite good at. 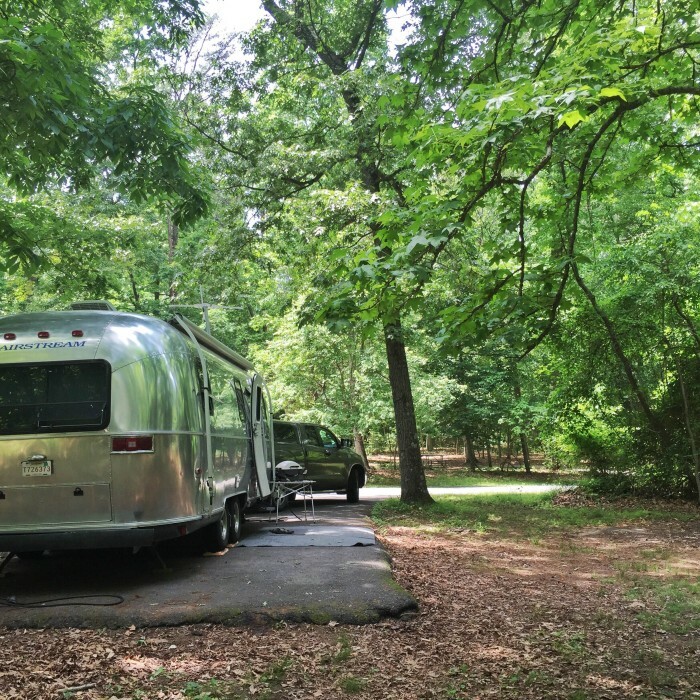 Our take is that if we avoid all potentially busy tourist destinations, or try to time our visits for the least busy times, or never leave the campground on weekends, then we are going to miss out on a whole lot of fun. Well it’s a good thing that we’ve adopted this attitude, because as it turns out we timed our visit perfectly to coincide with the prime season for middle school Washington trips. Oh boy! As soon as we stepped into the Natural History Museum we were greeted by a sea of pubescent kids outfitted in color coordinated shirts and hats. So what would have been a simply a moderately busy weekend turned into a really busy weekend. When you see a gaggle of kids in color coordinated shirts, it’s best to step aside. We breezed through the Natural History Museum fairly quickly. 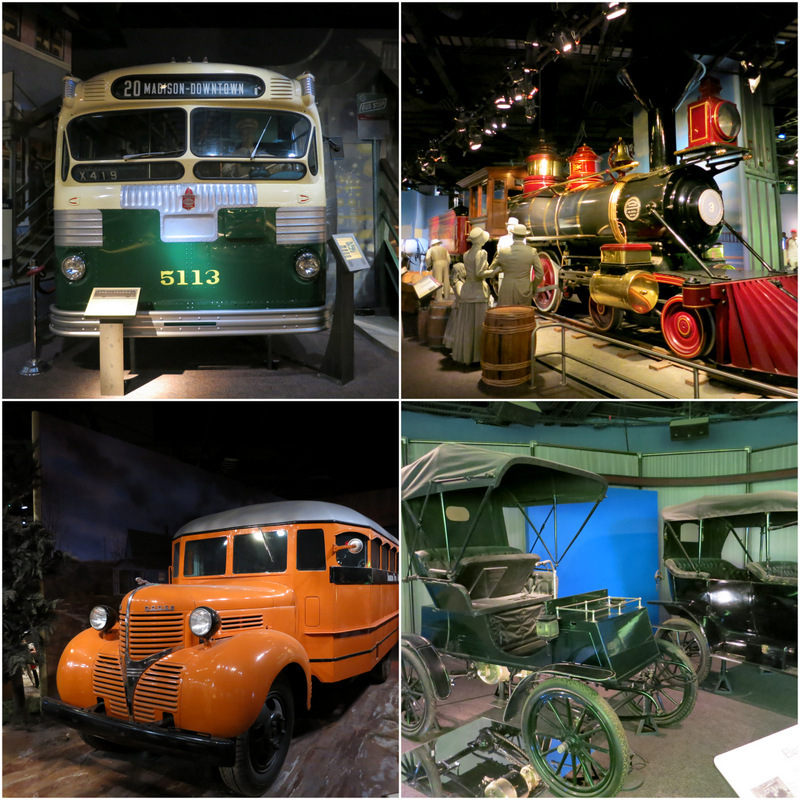 Partly because some areas were so packed with middle schoolers that we could’t get close to the displays, and in part because a lot of what’s in this museum is stuff that we have seen in other places around the country. 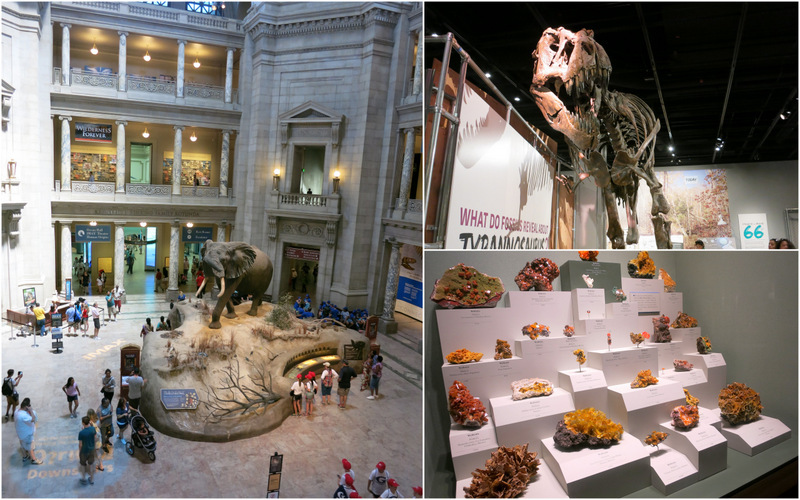 Let’s face it, after you’ve visited Dinosaur National Monument in Utah and gotten up close and personal with a massive cliff filled with prehistoric bones, it’s hard for even the best museum display to compete. 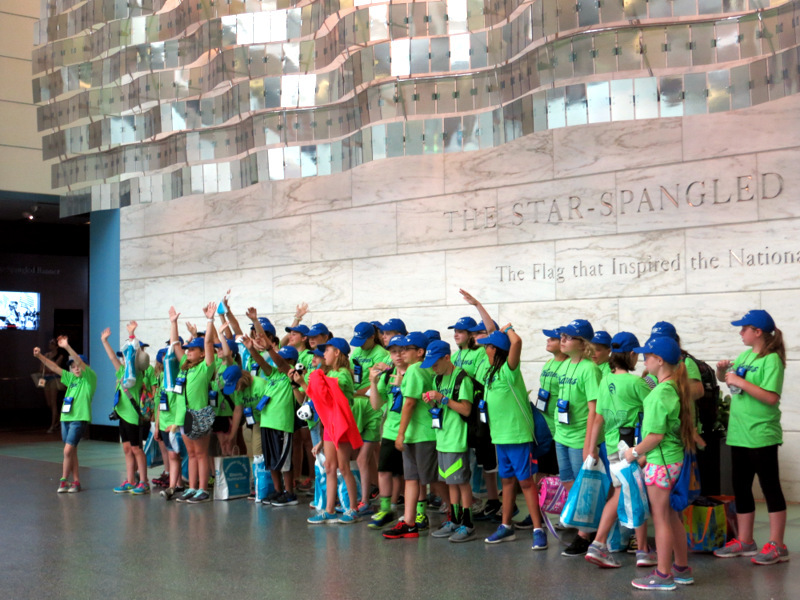 Next we wandered over to the National Museum of American History. We spent quite a few hours exploring this huge museum. At first I was disappointed because nearly all of the west wing of the museum is closed for reconstruction (the first part is due to open in July and sounds pretty awesome). But it was probably for the best because if the entire museum had been open we would have been there forever. I can’t even begin to describe all the awesomeness that we saw here. 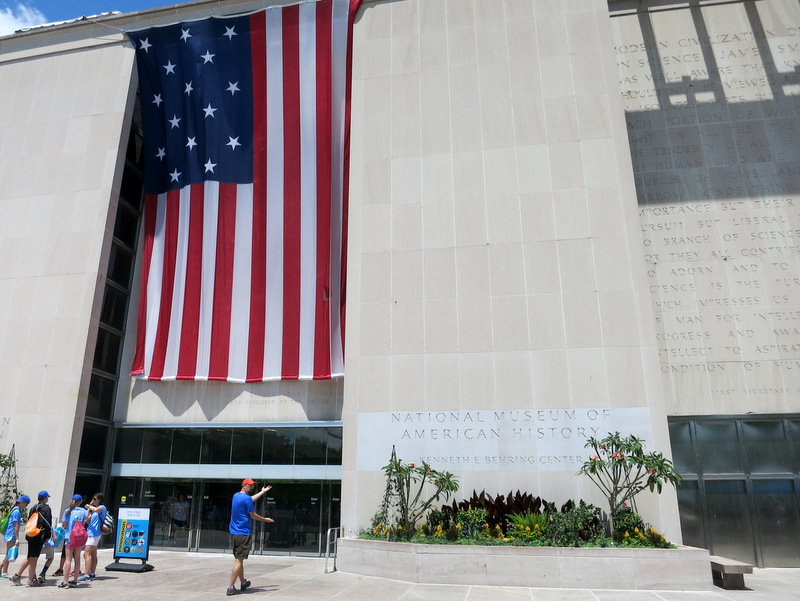 Some of the highlights were the transportation exhibit, the light and power exhibit, the price of war exhibit, and of course, the original flag that inspired the Star Spangled Banner (no photos allowed of this fragile piece of history). By the time we tore ourselves away from all this amazing American history it was mid-afternoon and we had to get a move on if we were going to see any of the memorials. Originally we thought we might bring our bikes to make it quicker to get around, but when temperatures were forecasted to be in the 90s we decided against it. I don’t know though, walking around in that heat was probably not any cooler than it would have been riding bikes. We headed down the mall (well not exactly on the mall, since it’s currently under construction) following a curved path around the Washington Monument. Next we passed by the World War II Memorial where dozens of tourists were seeking relief from the heat by dipping their feet in the fountain. It looked tempting, but we were on a mission and had no time to stop. 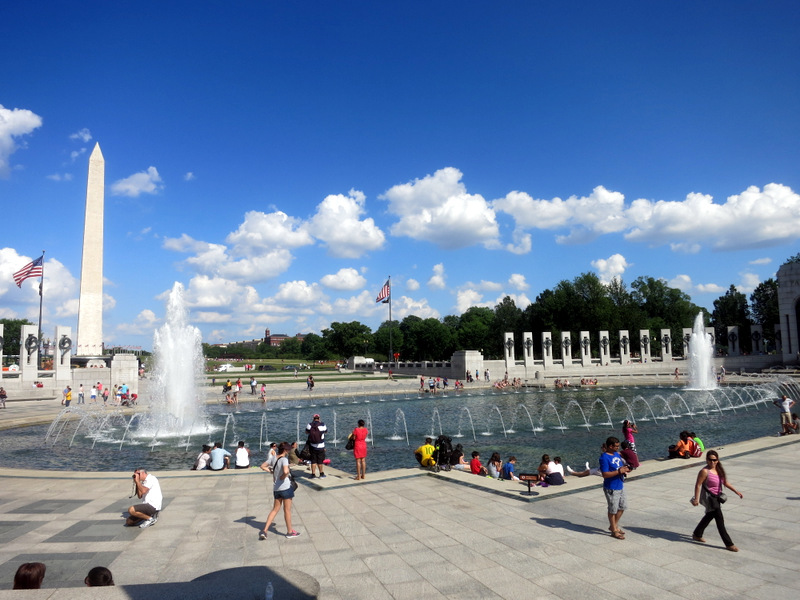 World War II Memorial or bathing pool? 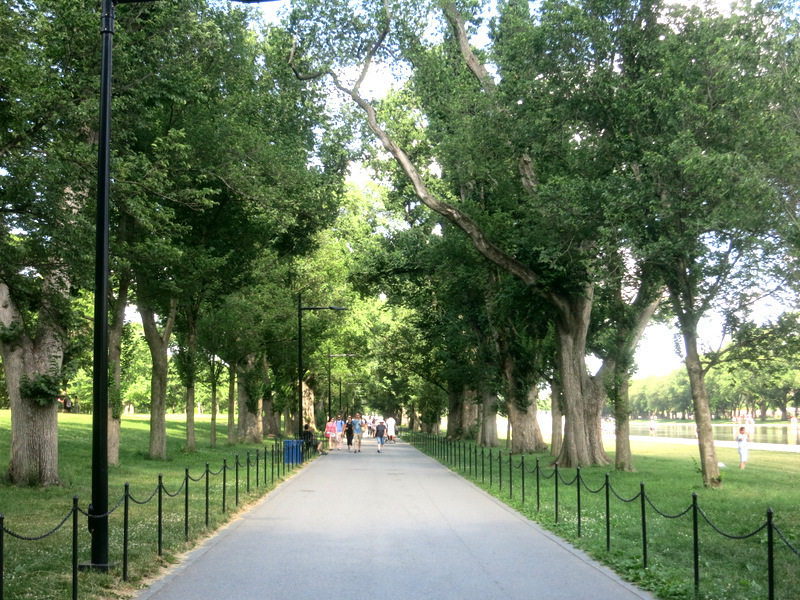 Continuing past the reflecting pool we made our way down a long shaded pathway to the Lincoln Memorial. We arrived to find masses of people congregating on the steps. Lincoln is back there somewhere. Are you in there Lincoln? 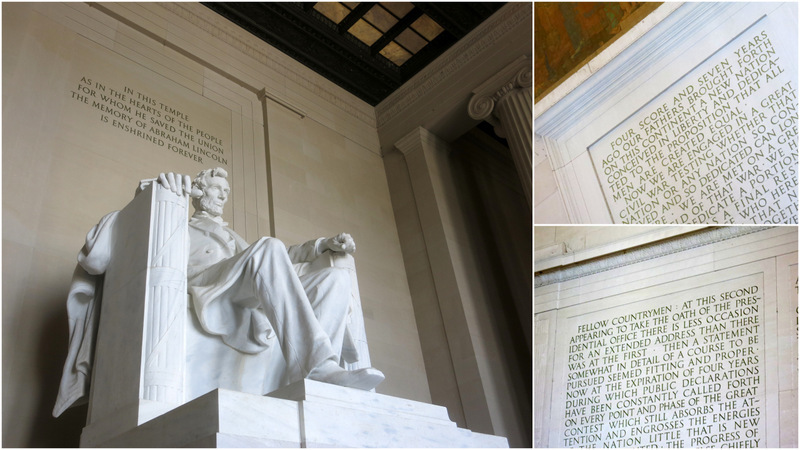 We managed to make our way through the masses and got a glimpse of Lincoln – along with some of his famous words. The view from the top of the memorial might just be the best in the city. 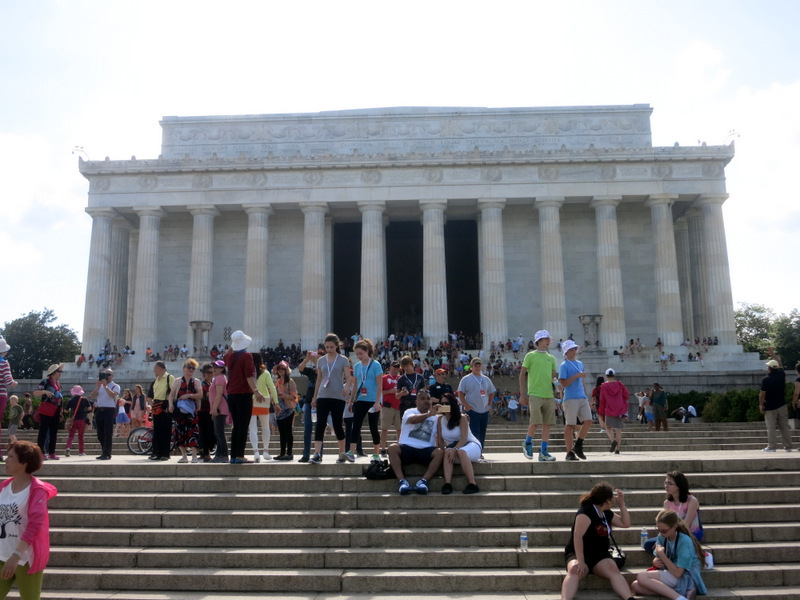 At this point I still had grand illusions of us walking in a big loop and stopping along the way to see the Martin Luther King Jr Memorial, the FDR Memorial, and the Jefferson Memorial, before making our way back to the Metro station. But then Tim told me that we were looking at miles of walking, and with the extreme heat combined with already tired feet we had to revise the plan. Instead of more memorials we headed back down the mall in the direction of the HirshHorn Museum. Of course, by the time we arrived it was after 5:30 and closed for the day. 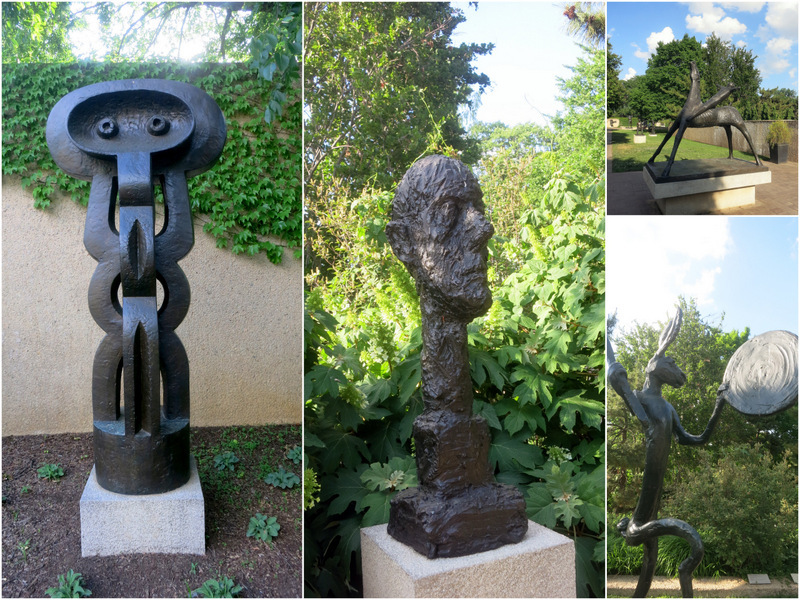 So we strolled through the sculpture garden instead. At this point we could have tried to squeeze in a quick visit the the Air & Space museum which stays open until 7:30, but we wisely decided that we were far too worn out from the heat (have I mentioned that it was hot) to think of spending another few hours on our feet. Instead we walked a few blocks to Pi Pizzeria where we refreshed ourselves with cold beer and the most delicious thin crust pizza topped with prosciutto, goat cheese and fresh arugula. We decided one more stop was in order before we headed home and convinced our feet to walk just a few more blocks to the White House. 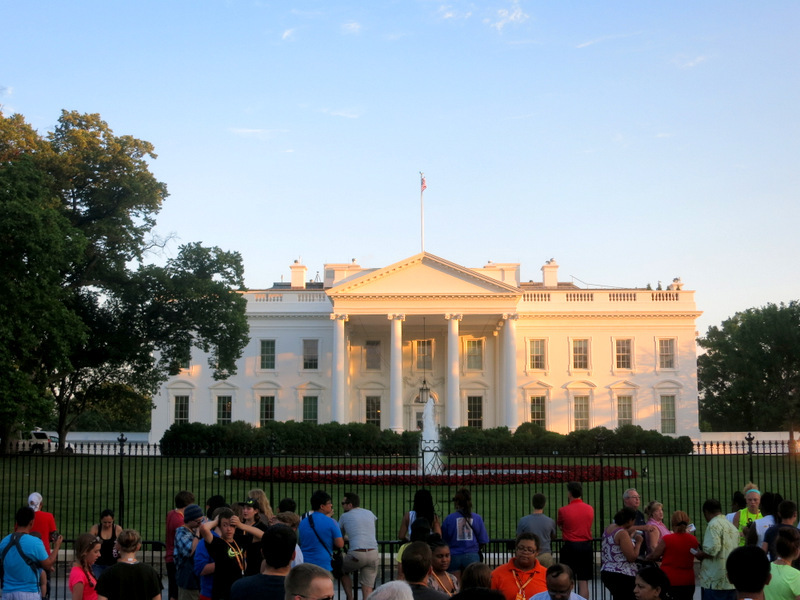 We arrived to find a good sized crowd and a large white house bathed in evening light. Sunday morning we preformed the same ritual with the Metro, and even managed to arrive in the city about an hour earlier than the day before (so around 10 instead of 11). First stop? The National Archives Museum. 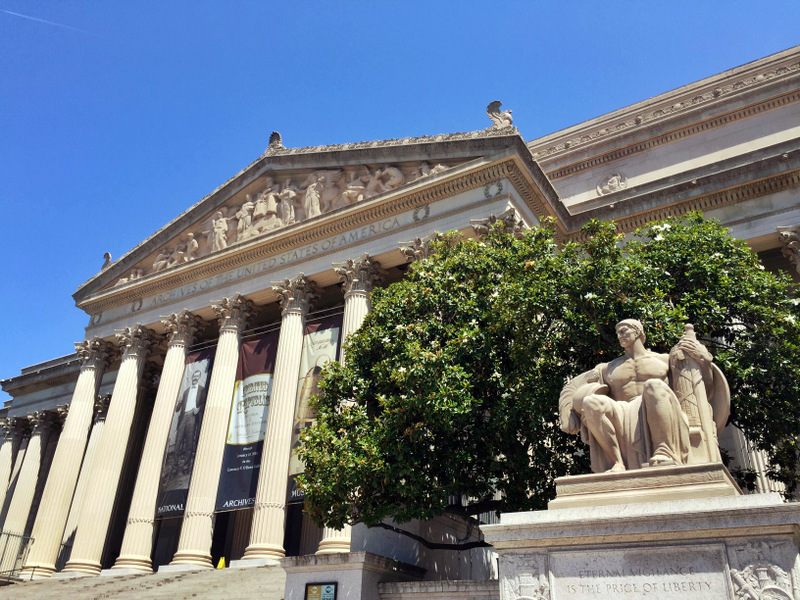 There is no photography allowed inside the museum, so you’ll just have to trust me when I tell you that we saw such old and important documents like the Declaration of Independence, the Constitution, and the Bill of Rights. Well, we kind of saw them. Despite the fact that only a set number of people are allowed in the rotunda area at one time, it was still far too crowded to get a good look. Oh well. The real reason we visited this museum was to see the “Spirited Republic: Alcohol in American History” exhibit. It was an interesting display that told the story of alcohol in America from the turn of the century, through prohibition and beyond. Since this is an archive museum the exhibit was full of, you guessed it…old documents and other artifacts. Documents like ship records showing the daily rations of alcohol for each sailor, original patents and labels, and a first edition of the Alcohol Anonymous. It was a really interesting and well done exhibit. Next up was the National Air & Space Museum. Like the Museum of Natural History this is another one that we’ve both visited before, and we went in knowing that we wouldn’t have time to see everything. 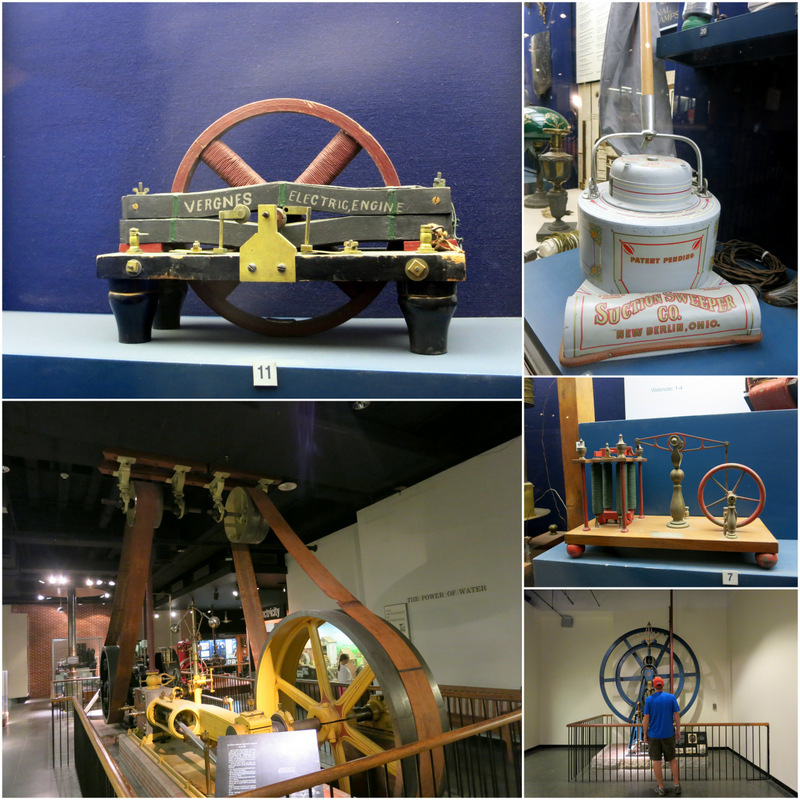 We ended up spending a few hours exploring the Air side of the museum. 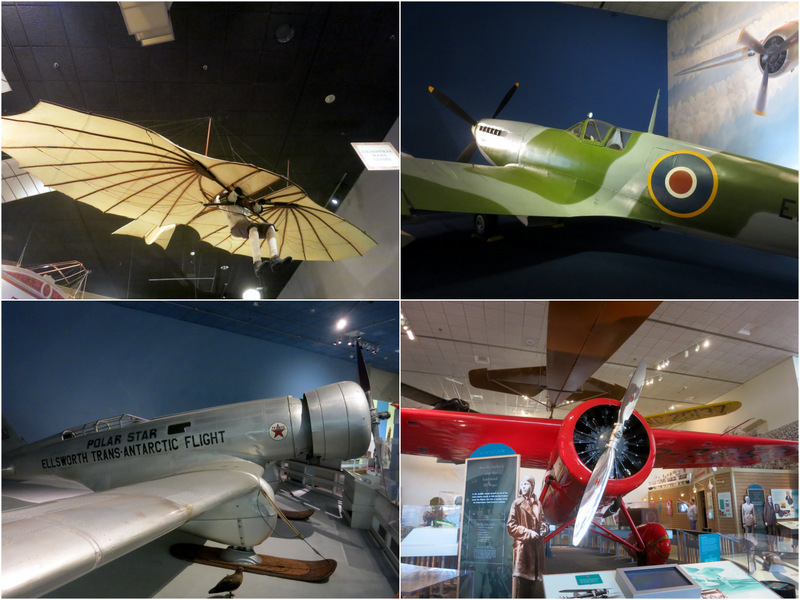 If you have any interest at all in the history of airplanes, this museum has got you covered. From early gliders, to high powered jets, military airplanes, and passenger planes, we saw it all. We cruised through the space exhibits pretty fast, even skipping over some entirely. More for to save time than anything. Since we recently spent an entire day at the Kennedy Space Center in Florida we didn’t feel too bad about missing out on the space exhibits here. After the Air & Space Museum we had a decision to make. A late lunch followed by another museum, or the long trek over to the memorials that we missed out on the day before? Since it was now after noon, and the temperatures were already in the low 90s we opted for another air conditioned museum. Can you blame us? On the way we made a quick dash through the sculpture garden at the National Gallery of Art. 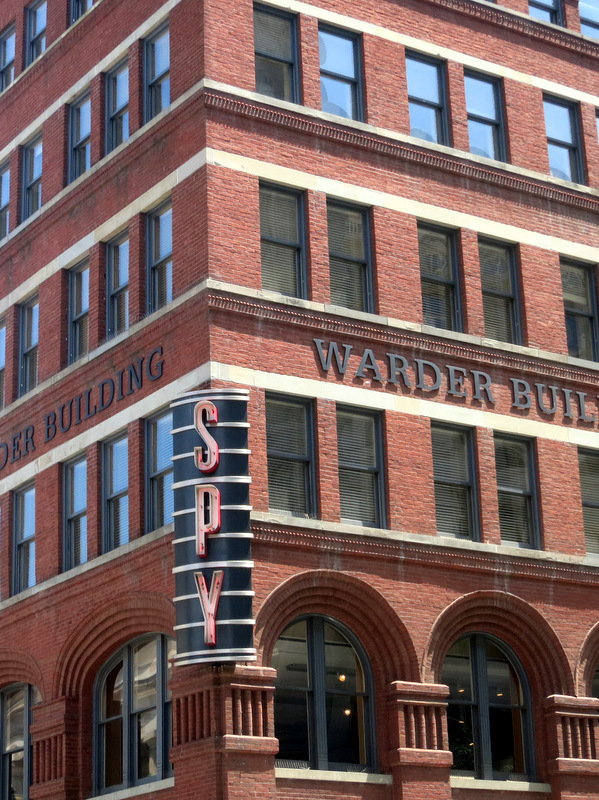 If you spend any time reading online guides to D.C. museums you are sure to come across the International Spy Museum. Unlike the national museums, this one is not free (22 bucks for adults with a significant price drop for senior and kids), but everyone said it was worth it, so we decided to give it a shot. I will admit that we were a bit worried at first that we made the wrong decision. You start out in a room where you are instructed to choose an identity and memorize the details. Then you watch a short video on why people become spies. It seemed geared towards kids and we were afraid it would be boring and juvenile. But then we entered the exhibit area and it turned out to be really, really cool. There were tons of spy related artifacts, and an entire section on the history of spying that went back to the ancient Romans. I had a few moments of annoyance because of the crowds (I know, I know, we made a pact). The exhibit space was pretty small and in some places so full of people that you could barely see the items on display. We ended up spending several hours looking at tiny hidden shoe cameras, ancient cryptographs, and memorabilia from famous spies. And then we went downstairs and discovered that the entire first floor was a giant exhibit celebrating 50 years of James Bond. At this point we were both pretty much done. Since neither of us are very interested in Bond movies we breezed through in about 20 minutes. I will say that if you are a Bond fan, you would probably love this exhibit and could easily spend hours here. There you have it, two jam packed days of museums and memorials in our nation’s capital. Do we wish we had the time and energy to visit more? Of course. But in the end we’re very happy with the museums and memorials that we did see. And while our campground of choice wasn’t really up to standards, it was very conveniently located and allowed us to easily venture into the city. You had to be tired after all of that. We spent 3 months in that area and loved it and hope to return. Bikes make all the difference both the C&O and national park. Three months! How Fun! I can definitely understand the draw to spending an extended amount of time in the area. There is so much to do and see. I so agree that on the road we have so many opportunities to see artifacts in a more natural setting that sometimes seeing them in a museum is anticlimatic. Boy, you sure had some perfect clouds for your Washington Monument photos! You aren’t kidding about the crowds! That’ll test the most patient of temperaments. Then add in the heat…it’s not supposed to be summer yet!!! I hope your next site is much better and nice and calm and shady! The clouds were indeed kind to use for that photo :) We had heard there was a chance it would be hot this time of year. Apparently more of a chance then we thought! We survived it though and have since moved on to a very nice state park in Delaware with perfect temperatures. Sounds like a fun time in the Capital city.. Your post get me to thinking about a couple of things..
1. Like you when we go full time, 4-6 yrs, my wife will be needing good high speed internet to up and down load sometime large files.. She does contract work for a company in RTP working in books and needs to get and put files on the company FTP. Where have you found or what have you found is the best way to facilitate that need.. are the starbucks and such a good place to do this type of heavy file transfer.. some could be 300 meg FTP files and when doing e books larger. 2, Could you use the Razer type scooters around the city like DC.. Not as nice as a bike but a lot easier to get in and out of places.. They make nice carriers for them with straps you can sling them on your back. just thinking for the future. Finding fast wifi can be really hit and miss. Sometimes coffee shops and libraries are good, but you really never know until you get there. Or sometimes it can be zipping along and then a whole bunch of people arrive and things crawl to a halt. We are lucky in that we have an unlimited Verizon plan so provided we find a strong signal we can use as much data as we want. Last time we were in DC it was July 4th, and so hot out at night (in the upper 90’s) that the crowd watching the fireworks on the Mall were all standing around in the equally warm Reflecting Pool trying to cool off, including us. (We tried not to think how gross the water probably was.) Glad you weren’t quite that hot. Too bad about the Green Belt Park campground. Ugh! I hate that kind of heat. I think I might have resorted to the the reflecting pool as well (although it did smell pretty bad). I bet seeing the fireworks there was a really awesome experience though! Truck windows smashed, gear stolen and later had baby buggy stolen in Smithsonian. Thugs and thieves can have it. Okay, after reading of your experience at Greenbelt and LuAnn & Terry’s, there’s no way we’re going to stay at that park. Too bad because it would be convenient. You did a great job of planning out your adventures in the city — although I think after your experience, we’ll take our bikes. I really wouldn’t recommend staying there. It’s too bad because the location and price are perfect. And yes, bring your bikes! DV is on my list. Its been years since either of us visited their. I’m super excited for day one to get here. Thank you. Neither of us had been in many, many years. It was really fun to re-visit. 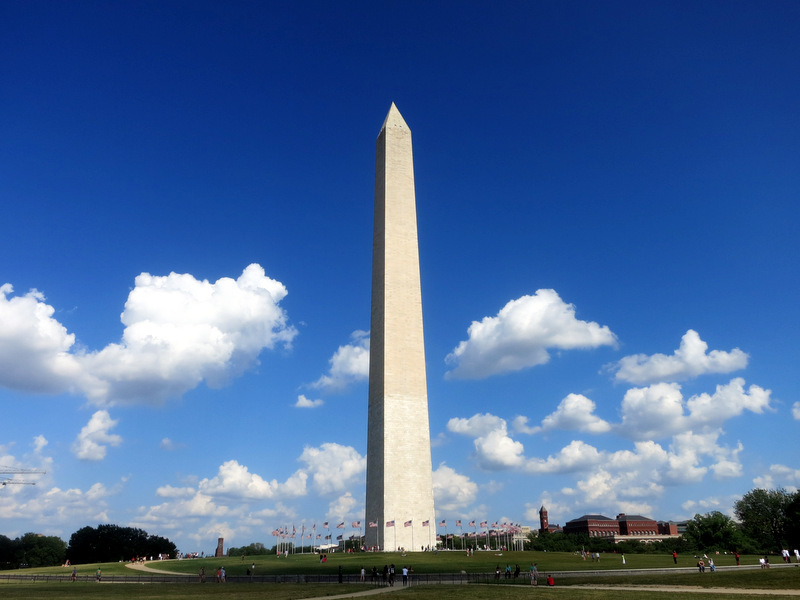 D.C. has so many museums and monuments that spending a month means you only scratched the surface! I think you did a pretty good job planning it out. 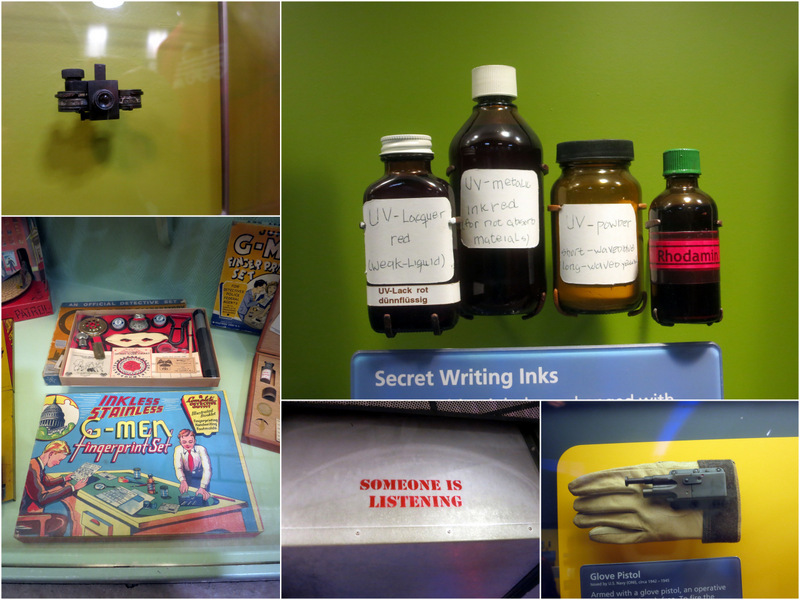 I had forgotten about the spy museum, it is fun. 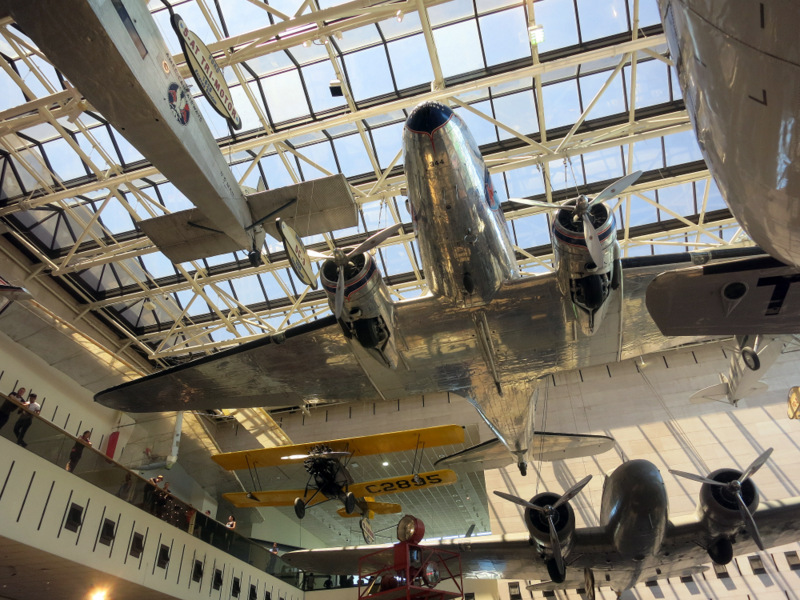 We only made a quick overnight in the area last year to do two things: visit a friend and visit the Udvar Hazy museum. It’s like an extension of the Air & Space museum out in the burbs with more space (and space shuttle). Brandon absolutely loved it. You’re right. It’s a hard city explore in a single weekend. 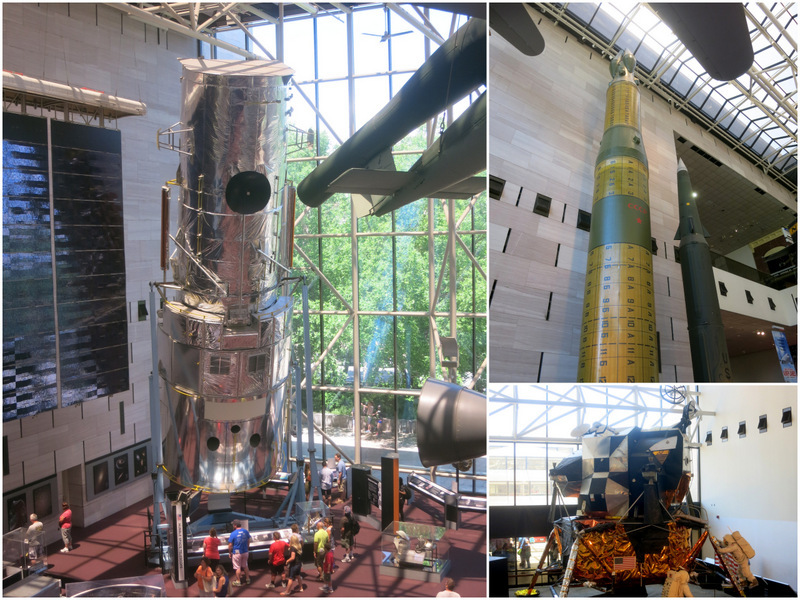 The Udvar Hazy museum sounds pretty cool! Thanks for the rerun of DC. You certainly saw a lot given the heat and crowds. 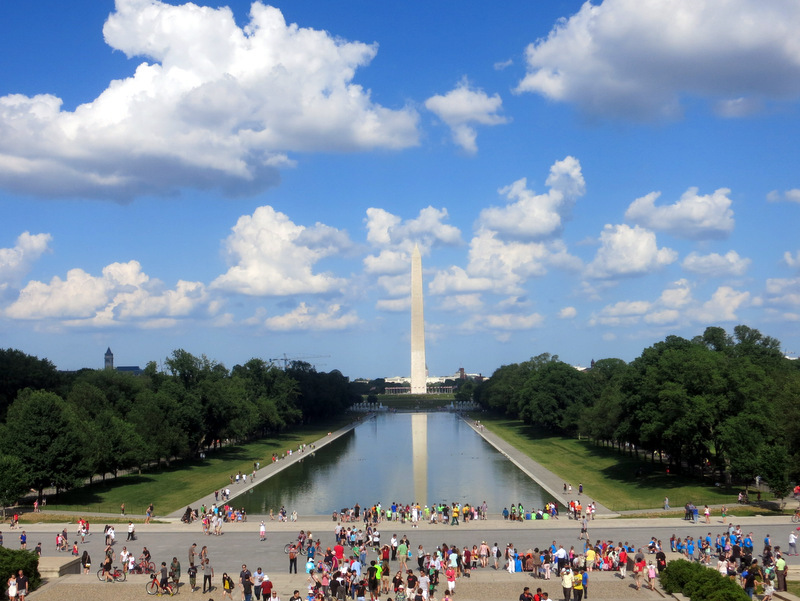 Did you happen to look down when you took your above pic of the wading pool with the big pencil (washington monument). The shot looks like you are standing on the same landing MLK gave his famous “I had a dream” speech and there’s an engraving in the landing where he stood. It gave me a wee shiver when I quite unexpectedly looked down and saw it when we were there 4 yrs ago.